This post a little less thorough than usual on the links; hopefully just as much actual science stuffed inside though. The material herein covers roughly the period from 6 February to 15 March 2015. Past/Present. 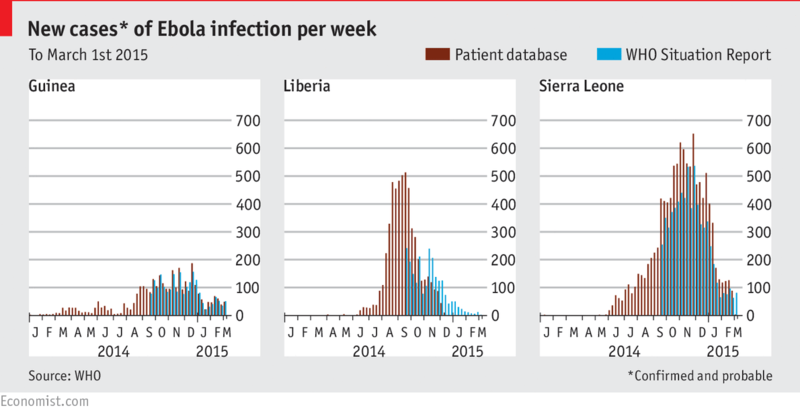 The great news is that the Liberian epidemic is firmly under control, maybe even closed down for the moment. There hasn’t been a new confirmed case in the country since late February (perhaps the 24th? ), and the last patient was released by March 5th. The risk of transmission from hidden infection chains, or from abroad, remains. But Liberia seems in good shape, and the cautious government has now lifted many of the country’s travel restrictions and its nightly curfew. Unfortunately the same cannot quite be said for Guinea and Sierra Leone. In SL the lifting of travel restrictions seems to have led to infection being spread around, and finding all the cases and their contacts is still proving difficult. The headline news in the past week or so was the outbreak based around the fishing community of Aberdeen close to Freetown. But there continue to be cases found throughout the north/west of the country. SL has now re-opened some border crossings with Liberia; how that will affect each country remains to be seen. The situation in Guinea seems a little darker. Where transmission chains are not being found in SL, perhaps due to passive resistance to tracers, in Guinea there is active mistrust and anger towards public health professionals, leading to (possibly growing levels of) violence. There are also hidden transmission chains. Future. Predicting the future trajectory of the epidemic is getting harder as mass-action effects become less important, and variability in individuals’ contact patterns drives case loads. While there remain some “curve fitting” models out there, the shift now has been towards more nuanced modelling efforts. One approach is to look at finer level than the country. In this article by Anton Camacho and colleagues model each Sierra Leonean district’s epidemic separately. In a short piece, Gabriel Rainisch and colleagues show that just information on population and distance between districts is enough to predict with some accuracy how infection will spread across the region. Another approach is to explicitly model the contact network in each country; in a recent paper Constantinos Siettos and colleagues did this, successfully predicting the Liberia fade-out in late 2014, and the subsequent SL drop-off in cases in early 2015. However, such models still appear (understandably) unable to predict rebounds such as those seen in SL in February and March, or Guinea on several occasions. In order to predict such highly stochastic events, some kind of probabilistic model of divergent epidemic paths (either it dies out, or it blows up) would be needed. Which sounds like several steps forwards in modelling development; I won’t hold my breath on that front. Modelling. If you have some spare time, and a slightly obsessive interest in modelling Ebola, you probably can’t do better than spend some time watching the presentations from last month’s Ebola modelling workshop organised by LSHTM and WHO in London. Videos of all the sessions are here. First off, there has been a reprise in the academic literature of an idea that seemed to have faded away last year: that Ebola might be spread through the air. Michael Osterholm and colleagues have published a thorough review of the transmissibility of Ebola that covered many important aspects of the disease. (Osterholm paper). But the headline that ran in the Washington Post was “Limited airborne transmission of Ebola is ‘very likely,’ new analysis says“. As many researchers, and some news outlets, pointed out, while the study did “hypothesize that Ebola viruses have the potential to be respiratory pathogens with primary respiratory spread”, this didn’t seem to be backed up with any strong evidence, other than the potential for Ebola to infect the respiratory tract. As virologist Ian Mackay has been pointing out for some time, while this may lead to aerosol spread, it is very unlikely to then evolve into airborne spread. Read about this here, here and here. Or read the views of a couple of other virologists: Vincent Racaniello, Professor at Columbia University (here) and John Oxford, Emeritus Professor at the University of London (here). TL;DR, Ebola is very very unlikely to go airborne any time soon. For a much more considered read of much of the same literature, please consider another review by Seth Judson and colleagues instead. (Judson paper). A few groups have been examining the mortality impact of Ebola. While MSF has been reporting that the fatality rate at their facilities has been dropping over time, now down to ~52%, the Red Cross has noted that they have attended at least 14,000 deaths during the epidemic – some 5,000 more than the total number of cumulative deaths reported by national governments/WHO. So the overall direct mortality rate is almost certainly higher than official numbers. On a connected note, Stephane Helleringer and Andrew Noymer published a paper showing that Ebola has directly reduced life expectancy by around a year in Guinea and at least 1.5 years (maybe over 5 years) in Sierra Leone and Liberia. (Helleringer paper). And that’s without considering all the indirect deaths from non-treatment of other health conditions (malaria; pregnancy; diabetes; etc). The final toll of this epidemic is likely to be very sobering. Another issue that I have mentioned a couple of times before is post-acute illness. As well as fatigue and muscle weakness, possibly reflecting the overall impact of Ebola on a human body, it seems that complications of the eye are common. The establishment of a survivor clinic near Monrovia may help us understand these long-term effects, so long as it doesn’t serve as a focal point for the already considerable stigma associated with recovery. There is also ongoing concern about the potential for sexual transmission post-recovery; I remain a little skeptical, but as Liberia moves forwards with no reported cases for the past 10 days, any future flare-ups may provide suggestive evidence on this topic. I will also note this article by Adnan Khan and colleagues looking at R0; they find similar estimates to other papers. And finally, Joseph Prescott and colleagues have shown that it is possible to find viable virus in swabs of macaques up to seven days postmortem, reinforcing the need for rapid burials or other death rites. From a quick piece by Jina Moore at Buzzfeed. Movement: As mentioned above, Liberia has relaxed their travel restrictions as case numbers hit zero last week. In contrast, Sierra Leone has re-introduced some movement restrictions, notably on boats and trucks. Potentially more importantly, as the next wet season approaches there is concern that movement will be restricted for those trying to find cases – although it should also reduce the virus’ ability to circulate, hopefully. Case finding: Contact tracing – both from known cases and from secret burials – and subsequent monitoring of said contacts has become the core of the current epidemic-fighting phase. In this context, a paper by Francis Kateh and colleagues outlining rapid response methods used last year in Liberia is very timely reading. Their “RITE” method emphasizes the technical side of isolating cases, and finding and observing contacts. Three other papers in the same edition of Mortality and Morbidity Weekly Report [pdf] present case studies of implementing such methods, highlighting the importance of working with existing community structures and chiefs to avoid conflict and further spread. One technological improvement that might greatly assist contact tracing efforts would be a fast, reliable test for the disease. On this front, a 15-minute test was approved by the WHO in late February for use in West Africa. With a sensitivity/specificity of 92%/85%, it remains imperfect, but at a cost of less than $5 a time, it may well be able to act as a first-line method for on-the-ground work. There has also been some progress on a test to differentiate various common sources of fever seen in West Africa – while still in the lab, the test would differentiate yellow fever, dengue and Ebola. Clearly there would be need to extend this to include other viral haemorrhagic fevers and malaria, but a good start. Safe burials: The only news I saw on this front was a UN report in early February suggesting that secret burials may be one reason for the uptick in cases in Guinea and SL. In this context, this paper by Paul Richards and colleagues that I first saw in November remains essential reading: Richards highlights the role of funerals in rural areas in managing the shifts in social relationships that arise from a death (among several other topics). In related news, Sierra Leone has re-imposed a stringent burial process for all deaths in the country to try and reduce transmission. There are several new papers using models to look at how various combinations of interventions might have helped with epidemic control. I honestly haven’t read them in depth, but include them here for completeness/interest: LD Valdez and colleagues on the arXiv; Marisa Eisenberg and colleagues on the arXiv; and Glenn Webb and colleagues in PLoS Currents Outbreaks. If you read one piece on drug and vaccine trials, it should probably be this overview in the LA Times. If you read two pieces, I would recommend this back-and-forth in JAMA about the ethics of randomization in an epidemic setting (OK, so officially this is four articles, but they’re all short): Steven Joffe; Morenike Oluwatoyin Folayan et al. ; Steve Kanters et al. ; Steven Joffe again. This is also a good insight into academic debate conducted in a public forum. Favipiravir. The first “proof-of-concept” trial of this drug in Guinea is complete. Early results show that participants who were initially less ill did better on average than similar individuals had at the same hospital prior to the trial (i.e. compared to historic controls). Debate continues as to whether this finding should be interpreted as evidence for a protective effect. If favipiravir is seen as effective and then used more widely, it will complicate all future trials of Ebola drugs that were planning to use historic controls, especially favipiravir’s effectiveness is not firmly known. ZMapp. A randomized trial of ZMapp (the first treatment suggested all the way back in August) finally began in Liberia in late February. However, given the lack of current cases, it may need to be moved elsewhere. Survivor-plasma. While a trial of blood plasma from Ebola survivors has been running since December in Liberia, a second one started in Guinea in mid-February. No word on results yet, but I noticed a modelling paper by Alexander Gutfraind and Lauren Ancel Meyer that highlighted the potential benefits of plasma transfusion if it reduces mortality (essentially, the benefit will be [%hospitalized * %reduction in mortality]). Nothing groundbreaking, but useful to bear in mind. TKM-Ebola. A phase II, non-controlled trial of this drug has recently begun in Port Loko, Sierra Leone (where there are still a steady flow of patients, unfortunately). The drug appears to require considerable staff resources to deliver, which may be feasible in the downswing of an epidemic, but perhaps not when caseloads are rising exponentially? Tetradine. This herbal extract got quite a lot of media coverage when it was shown effective in mice in an article by Yasuteru Sakuri and colleagues in Science. Next step, large animal and primate studies. Brincidofivir. This one isn’t quite like the others, since the trial of this drug in Liberia was stopped early by its manufacturers. I include it hear since there remain questions as to why it was stopped early, with only 10 patients enrolled. Something to watch in the future, perhaps? VSV-EBOV. And neither is this one, since it is a vaccine candidate. In fact, this relates to a case study of a healthcare worker who received VSV as post-exposure prophylaxis following a needlestick injury. While Ebola virus was never detected, a strong virus-specific immune response was seen. (Academic article by Lilin Lai and colleagues.) Another avenue of potential investigation? And if you only plan on ever reading one article on drug trials for Ebola, it should probably be this lengthy but comprehensive and highly humanized account from Sarah Boseley the Guardian. Non-drugs: Perhaps the most long-lived debate in the Ebola treatment world appears to revolve around needles: who gets intravenous treatments, how often, for how long, etc. Partners in Health have recently taken an aggressive stance on this topic, arguing for two intravenous lines for rehydration. Evidence for this approach remains unclear, but one study by Paul Rees and colleagues out this week suggested that in well-controlled environments (specifically, a 12-bed British military treatment unit), early central venous catheterization is feasible and safe. How well this will translates to general-population ETUs is less clear. Liberia. With no new cases in almost three weeks, the chances of a significant finding are waning in Liberia. In addition, there appears to be stigma attached to signing up for the trial, which may further hamper efforts. Sierra Leone. Still no official start date, with delays currently being ascribed to regulatory approval requirements. The trial, amongst workers involved with the Ebola response, should start in the next few weeks. This trial will be using the VSV-EBOV, as opposed to the ChAd3, vaccine. Guinea. The innovative “ring vaccination” trial began in Guinea on March 7th. This trial will also be using the VSV-EBOV vaccine. While all this vaccine trial-age is important for the long-run battle against Ebola, it is important to note that no decision about mass vaccination is envisaged before August of this year, by which time it will hopefully not be needed for this epidemic. On the development side, I note that there is a fourth vaccine (Ebola-GP; Novovax) in early-stage trials in Australia. A WHO feature on the role of radio for risk communication; although as the piece notes, this can be inequality-promoting if used alone, since only the better-off have access to a receiving device. A news item from Reuters on the benefits of engaging with traditional healers in Guinea – quite crucial given their hands-on role at funerals and with sick persons. To tie these threads together, listening to communities and understanding the social bonds that hold them together, is crucial to effective interventions. Which brings us back to the benefits of involving anthropologists in the Ebola response. Guinea. Schools opened in January and remain open. Whether this is the best idea, I’m not so clear. Liberia. The good news is that schools are open, as of 16 February, with careful hygeine regulations. The less-good news is that the number of students attending is still inching up from a low initial base, as fears about inter-child contact remain. Sierra Leone. The latest plan is to re-open on 30 March 14 April, with concerns about potential disease transmission and the economic burden of schooling for parents. There has now also been an edict that pregnant girls cannot return, for fear of being a “negative influence” on their peers. How unfortunate. Economics: Another “I haven’t read it in detail, but” note: there’s a new publication out from UNDP highlighting the economic impact of Ebola across the whole West African region due to lower travel, investment and agriculture. Finances: There has been ongoing concern that funding for the epidemic has not been flowing smoothly. At the international level, the concern is that less money is arriving than promised. Karen Grépin recently showed the gap between promises and deliveries (spoiler: it’s not small) and highlighted the importance of tracking disbursements. At the country level, the concern is the opposite: less money is officially being spent than is arriving. Investigations into corruption are flowering. Health: As has been noted throughout the Ebola outbreak, many of the health concerns raised by the epidemic arise from its secondary effects. Perhaps the most talked-about effect is on maternal health, especially around childbirth. While data is sparse to date, there appears to be an expectation that the maternal death rate will double – to as high as 2000 per 100,000 live births in Sierra Leone – as a result of Ebola. Such worrying figures have led to calls from the UN and academics for special attention to be paid to women and children in the recovery phase. There are concerns about mental health for both the infected and the affected, and support plans are being built into recovery efforts. And just this week there has been significant publicity for a modelling study by Saka Takahashi and colleagues led by Justin Lessler at John’s Hopkins, highlighting the troubling fall-off in measles vaccination for young children (in contrast to the mass-prophylaxis efforts against malaria). They estimate that a measles outbreak in West Africa now might cause 2000-16,000 deaths; the same order of magnitude as Ebola itself. Also well worth reading is Leslie Robert’s commentary on the piece. Orphanhood: I tend to be wary of claims that an event “has left X thousand children orphaned”, both due to the various meanings of the term orphan – double; single; maternal; paternal – and due to some proportion of even double-orphans having other relatives or community members who still provide them with a home. However, in the case of Ebola I am more open to calls for concern for at least three reasons: (1) 15-44 year olds are at greater risk of infection than children; (2) infections are highly clustered with families; and (3) stigma follows the family members of the infected strongly, reducing the likelihood of foster care. So the recent suggestion that there may be 12,000 orphans from Ebola in Sierra Leone is worrying indeed. Especially when considering that Ebola has indirectly taken parents from many other children whose mothers died due to a lack of maternal care, or indeed other health care services. As ever, if you have seen something I’ve missed (or links are broken), you can reach me @harlingg. And as ever, thank you to all those on whose work this builds on. There are ten previous posts in this series and a summary of data/research sources.